Buffalo Chicken Dip. Quick and easy to make on short notice. I fell in love with Buffalo Wings almost 25 years ago. I can’t remember where I had them first T.G.I. Friday’s or Applebees?? But, I knew I was in love with the hot sauce soaked chicken wings dunked in ranch dressing….OOOOOOHHHHH! Just the thought of the of the fresh hot wings served with ranch dressing, celery sticks and fries. I think me and one of my friends would go out for wings once or twice a week after we got off work. Prior to that I had never had or even heard of Buffalo Wings. It was probably my favorite menu item for the next 2 years. Week in- week out. I even learned to make them at home. I baked my wings in the oven and made the sauce mixture on the stove top. Dipping the wings in the sauce and then baking for a few minutes more to create hot sauce cured chicken wings. Soon after, I became a mother and my craving for hot sauce decreased. It was still liked but, not loved so much. Anywho, every now & then I may still order hot wings hoping to grab a taste of what use to be. Hanging out late nights at the Applebee or the TGIF… those were my favorite things. 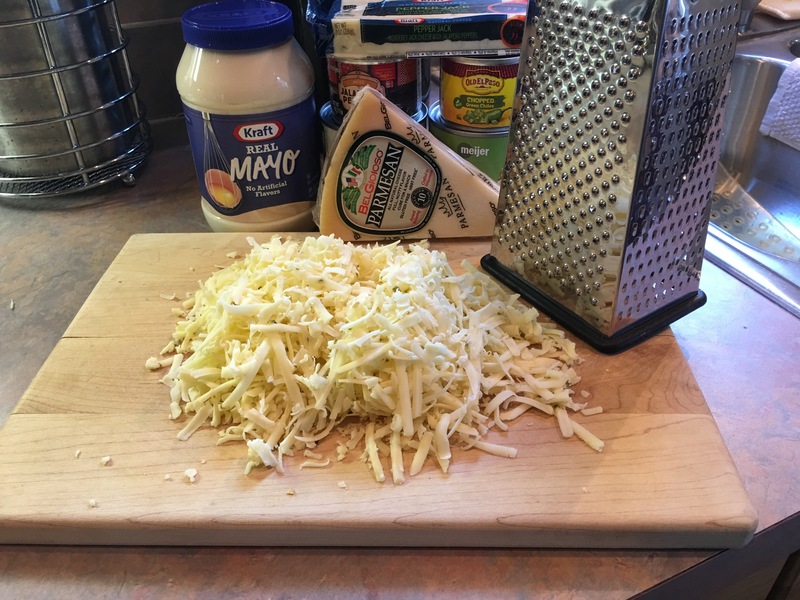 And, when I am just having a down right craving but do not desire the messiness of hot sauce hands I make this super easy, super quick Buffalo Chicken Dip. Seriously, it couldn’t even be any easier. Every ingredient is in a package you empty the packages into the bowl and measure out a couple of sauces and bake. I cant express how easy this is to make. 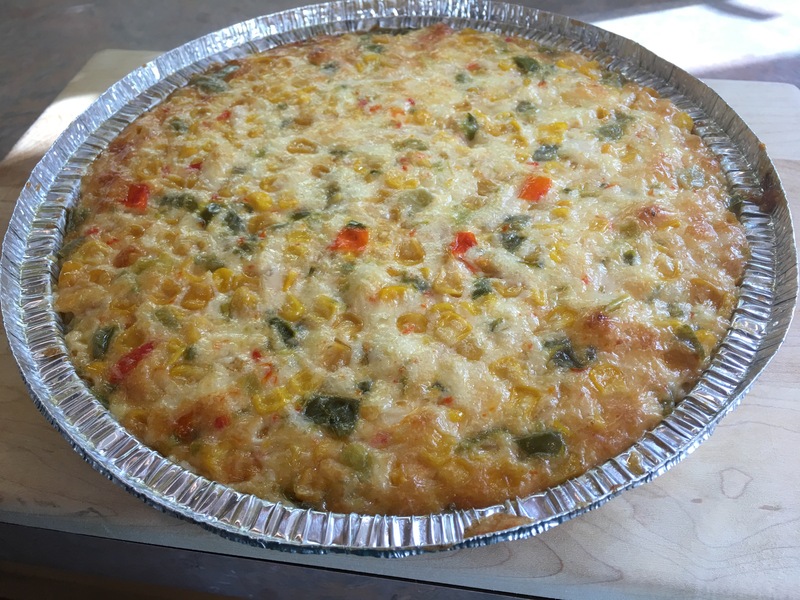 This dish is especially for the one who does not like to cook and the one who can not cook but wants to make a good impression as a guest to a girls night or game day party. You can serve this dip with chips, veggies, in a bread bowl or, with pita wedges as I do here today. Pita Bread tastes so good when it is warm and soft. I first had this dip when my mom ordered it from a caterer for a party we were having. Instantly, it was another favorite. I think it was the combo of the warm spicy ranch laced chicken being hugged by warm pita wedges. What else could I do but fall in love? Soon after I was in search of recipe. The online recipe reflected that making this number would be effortless but, worthy of a slot in my recipe box. So simple ingredients. Just go to the store and grab em’; stir and bake! I have to say it doesn’t look so pleasant in this state, but just wait for the finished product. Combine all ingredients (**except** pita wedges and thinly sliced green onions) in a medium or large bowl. Stir it all together until evenly combined. Transfer to a 1 quart baking dish. Bake for 20-30 minutes at 350 degrees until warmed through. 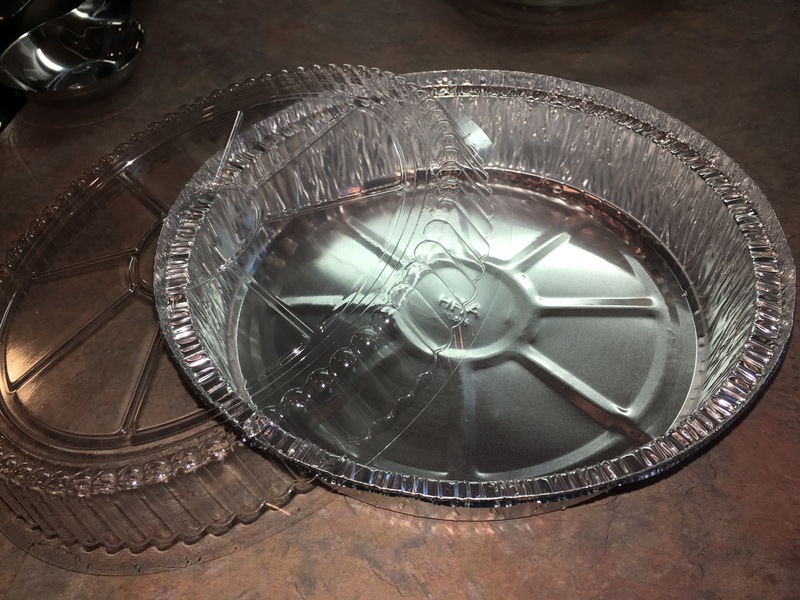 Place pita wedges in another baking dish and cover with foil. Bake the wedges 10-20 minutes until warmed through. Transfer the dip to a serving bowl and and the pita bread to a complementing platter. Garnish with sliced celery sticks. Serve dip and pita warm. 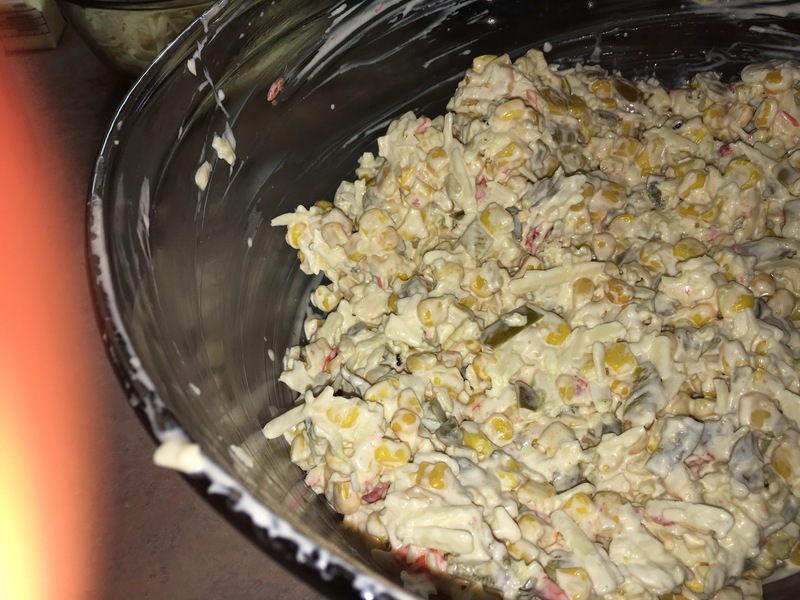 Now we have some pimento cheese looking concoction but I promise it is not. Bake in the oven and stir in the green onions last. I was using them as a garnish but, it tasted so good I mixed them right in. Transfer to a serving bowl and plate or platter, garnish with the celery sticks and serve warm. Hey you! Shoot me a comment and tell me what your favorite party dip is? Something I love to do is browse and read through recipes in cookbooks. I think it’s something I have loved most of my life. While growing up my mother had a collection of cookbooks and recipes. I don’t think she had the time to take advantage of her library of recipes the way I think she wanted to while raising my sister Katrina and I. I remember there were cookbooks by Betty Crocker, Ebony Magazine (both of them now in my collection), books just for cookies, Christmas recipes from newspaper clippings and cookbooks created by co-workers. I would look for easy to make, sweet and savory things. Somehow during a move many years ago some of the books and her favorite recipes were misplaced and never found again. Today her collection has blossomed even bigger than before. My grandma on the other hand…. In my 41 plus years I have ever only seen 3 to 4 cookbooks in her house. We spent just as much time at my grandparents house as we did at our own house growing up. My grandma could and would create great meals for our family. But, I almost never saw a cookbook or a recipe card. Almost. I remember 3 cookbooks at grandmas house. The first cookbook I spotted was in the upstairs of the master bathroom of all places (I guess she had no intention from the beginning of using that book). That’s the last place I would look for a cookbook. Well, I read through it plenty. I never got to make anything from but, I remember it clearly. It was a book put out by the Oral Roberts organization. I don’t recall the title but I could tell you exactly what that book looks like today. There was a spaghetti recipe I just wanted to make and taste just once. My mama didn’t make spaghetti enough and grandma didn’t make it like mama. So, all I could do was dream about that pasta and meat sauce through that recipe even though I had no idea what that recipe would taste like. (Go ahead and laugh, it’s ok). Anyway, the 2nd cookbook I remember was also never used at grandma’s house. I know this because mostly everything that was in that book grandma already made well. The only recipe book I have ever witnessed my grandma use is the book with the recipe for the yeast dinner rolls that she would make on Thanksgiving and on Christmas. My grandma, probably like so many other grandmas know just what to do to make breakfast, lunch, dinner and dessert come out perfect all the time. My grandma doesn’t have it written down. She just says some of this and some of that when I ask her how to make something. Grandma might not need recipes but, I do. I thrive on recipes and cookbooks. So, today I want to share not only a recipe but, also a favorite cookbook. Today will be the 1st Favorite Cookbook Friday! Today I picked to share with you a book by Trisha Yearwood. 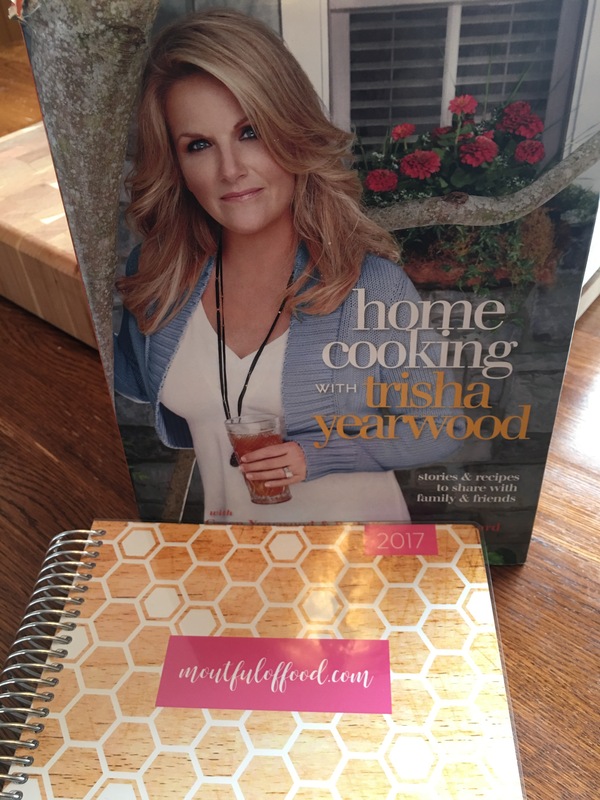 The book is titled Homecooking with Trisha Yearwood. It is co-authored by Trisha, her sister Beth and, her mom Gwen. This is only one of her cookbooks. So far she has written two. Both have great recipes. From the beginning the recipes and pictures are a feast for your eyes and then a treat for your belly if you desire. Waffles, pancakes, quiche, salads, sides, soups, entrees, desserts and, dips……Let me tell you about the Hot Corn Dip. I made it six times over the past Christmas season. I gave it as a gift for 4 separate households. I got rave reviews from each one. 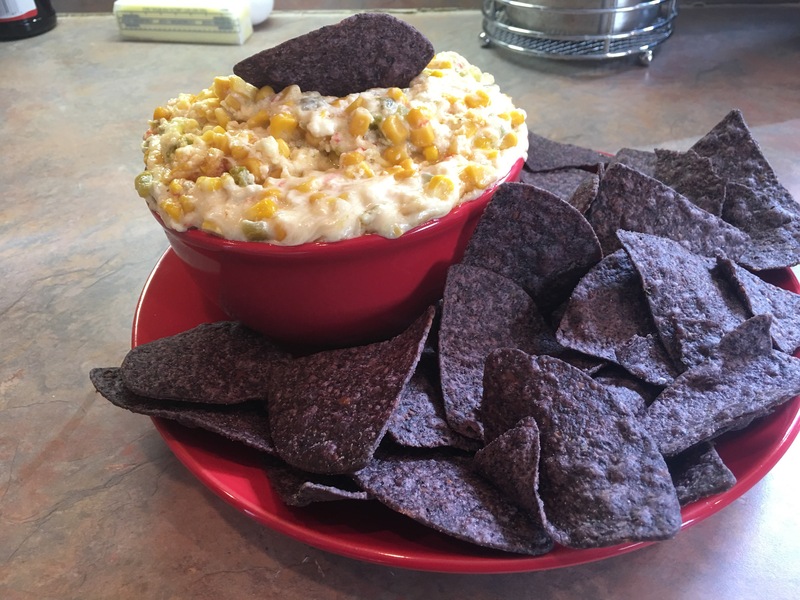 Consider this hot and spicy dip for your next party or get together or maybe even an appetizer before dinner at home with your loved ones. This appetizer is a ONE BOWL WONDER! Mostly. Drain the corn into a mesh strainer and transfer the drained corn into a large mixing bowl. Discard the juice. Drain chopped chiles and jalapeño and transfer to the large mixing bowl. Discard any juice. 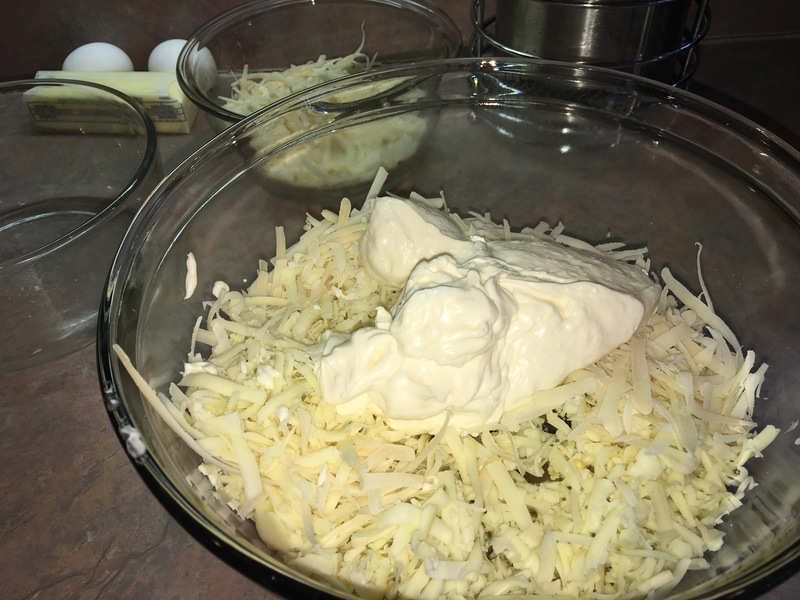 Add into the mixing bowl both the shredded cheeses, the mayonnaise and, the hot pepper flakes if desired. 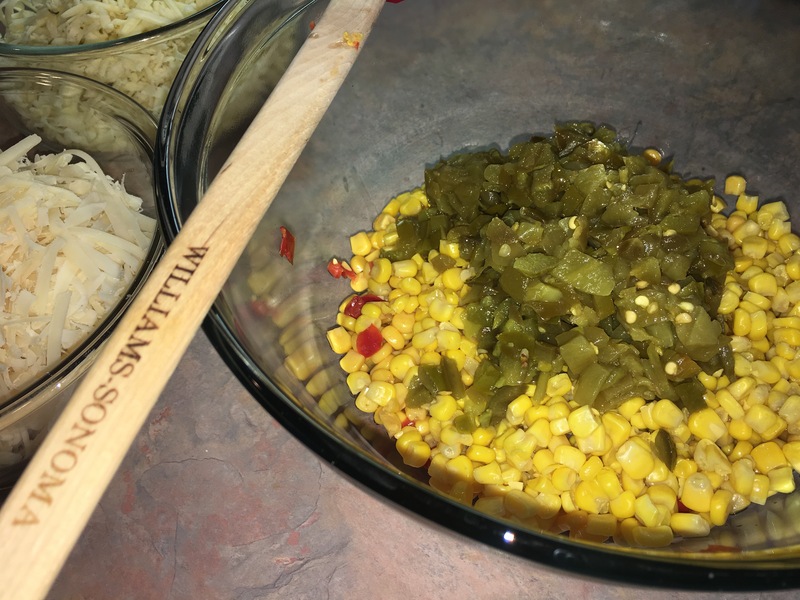 Mix all the ingredients in the large bowl until all ingredients are evenly combined. 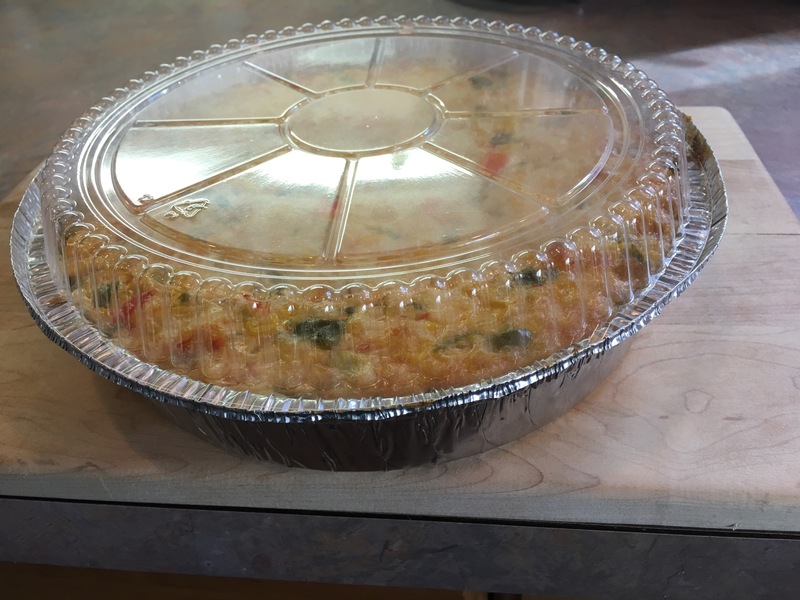 Spray a 9 or 10 inch pie plate or casserole with non stick cooking spray. 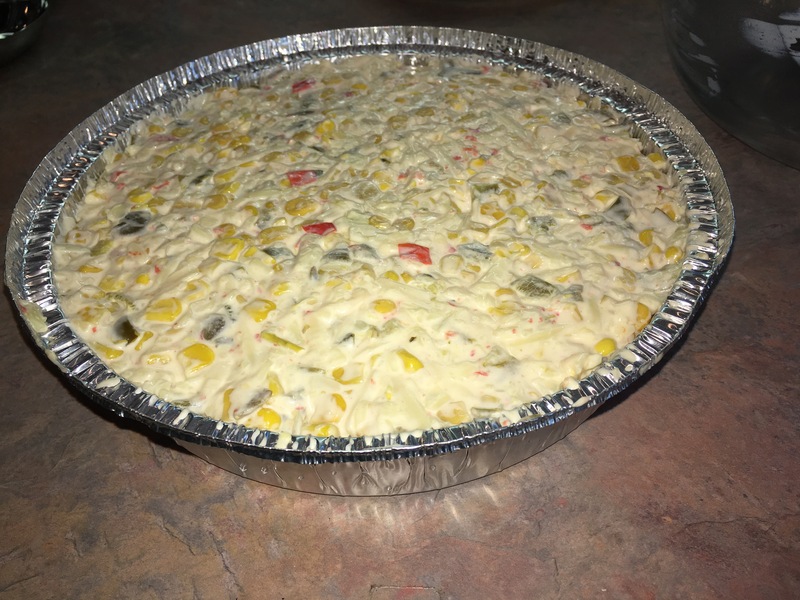 Transfer the corn mixture in the prepared pan or casserole dish. Bake in the oven for 30-40 minutes until hot, brown and bubbly. This recipe fits perfectly into a 9 inch aluminum pan from the restaurant supply store. Normally there are tops that match to make transport simple. While still warm, transfer to a nice serving bowl and platter. Serve with your favorite brand tortilla chips. Or take it to your next party or get together! What are your fondest memories of your mother’s and grandmother’s kitchen? Let me know in the comments!